Thanks much to filmmaker Bed Ged Low for filming a bit of video on some of our current work. The show is 11 minutes long, and we will show it this Friday at our final lecture and also put it up on YouTube. 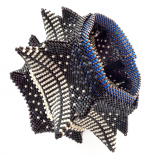 The Fibonacci sequence shown in this shot was beaded by Ursula Raymann, and it came from ideas that we had when the team was together last in France. I have a team piece like this to finish and show as well, with 5 hands and a dozen people’s ideas included. See you at the lecture (our classroom is only open to the MIT community this week) or see the lecture on YouTube the following week. What about demos in the hallways this week? Will those be open to the public? Hi! Oh, we will be on the move, here and there – there is no orderly schedule for where we will be, I’m sorry! You can be sure to find us in the classroom (26-322) between the hours of 2-5 on Tuesday, Weds and Thursday, so if you want to stop by and visit, and see Joke’s work (and you can’t make the Friday lecture) then that is the best solution. This entry was posted on January 28, 2019 by katemckinnon.